She is the face of Hindi cinema on the global platform, an ex-winner of the coveted Miss World title, and now a hands-on mother. Aishwarya Rai Bachchan, a name synonymous with grace, dignity, poise, beauty and brains was born to a middle-class Bunt family in Mangalore. This picture-perfect lady seems to have an enigmatic aura around her, which makes her one of the most desirable and highly sought-after Indian celebrities. In an industry, where actresses hide their marital status, fearing a dip in their popularity and subsequent market value, this thorough professional and confident actress has managed to strike a perfect balance between her career and personal life. Aishwarya has never let one aspect of her life shadow the other. And, thanks to her courage and skills, she has been enjoying the best of both the worlds! Gorgeous and talented, Aishwarya Rai Bachchan celebrates her 40th birthday on the November 1, and on the occasion of her birthday, Ganesha analyses her Kundali to find out what the future holds for the queen of hearts! Jupiter will be transiting over the 10th House in Aishwarya's chart till July 2014. After that, it will be transiting through the 11th House, in her chart. 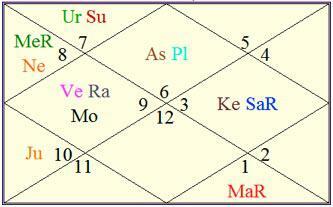 Rahu and Ketu will be transiting over the 2nd House – 8th House axis, in Aishwarya's chart, till July 2014. Post July 2014, Rahu will be transiting over her Ascendant and Ketu through the 7th House. She will be under the influence of Rahu major period and Mercury sub period till 25th May 2015. Ganesha feels that till July 2014, uncertainties may prevail in her career. Projects may get delayed or she may just appear in some interviews. A Full-fledged film career may be resumed only after July 2014. Ganesha feels that she will have to pay much more attention to her personal life and health during the year ahead, specifically after July 2014, when transiting Rahu enters her Ascendant. Aishwarya is likely to earn very well through endorsements and other means but not through films very soon – at least not before July 2014. Ganesha feels that Aishwarya Rai is likely to get into some humanitarian activities during the year ahead. Since she will be under the influence of Mercury sub-period, there is a strong possibility that she will try her hands at writing. If not regularly, she may occasionally pen down her thoughts and ideas. Good luck and may Lord Ganesha bless Aishwarya Rai with a great year ahead.